I can’t tell you how many times people, including friends ask me what I do all day, implying that I am siting home eating bon-bons and painting my nails. That I have time to get everything done and more and that stayinig home with the kids is an excuse not to work. Well…Stay-at-Home Mom’s, Working moms and Dads out there this one it for you…. I received this as a link on Facebook and it’s great. I couldn’t figure out how to copy it to my blog so I am going to retype it. It is from a column written by Carolyn Hax of The Washington Post. Its quick, witty and deserved to be shared. Tell me about it is the name of her column the title of this post isWhy don’t friends with kids have time? “Relax and enjoy. You’re funny. Or, you’re lying about having friends with kids. Or, you’re taking them at their word because they actually have kids, because you haven’t personally been in the same room as them. I keep wavering between giving you a straight answer and giving my forehead some keyboard. To claim you want to understand, while in the same breath implying that the only logical reason your mom-friends are either lying or competing with you, is disingenuous indeed. So, becuase it’s validation you want, the real answer is what you get. When you have young kids, your typical day is: constant attention from getting them out of bed, fed, cleaned and dressed; to keeping them out of harms way; to answering their coos, cries, questions: to having two arms and carrying one kid, one set of car keys, and supplies for even the quickest trips, including the latest to be declared essntial peice of molded plastic gear; to keeping them from unshelving books in the library; to keeping rest times, to staying one step ahead of them lest they get too tired, hungry or bor any one of which produces checkout line screaming. It’s constant vigilance, constant touch, constant use of your voice,constant reglegation of needs to the second tier. It’s constant scrutiny and second guessing from family and friends. It’s resisting constant temptations to seek short term relief at everyone’s long term expense. It’s doing all of this while concurrently teaching virtually everything-language, manners, safety,resourcefulness, discipline,curiosity, creativity, empathy. Everything. I was excited and put at ease when my daughter took to it. It soothed her when at times I couldn’t, and keep her pretty much content. But now, I look at the binkie with slight amusement and much despise. Just like another good ‘ol habit, I want to step on it, burn it and kick it to the curb. Sometimes I find myself asking, who invented the binkie and did they have children? The binkie should come with a warning label. This product can be addictive. Withdrawal can cause major distress to the user and the parent. Addiction can cause all parties involved sleepless nights, temper tantrums and crying fits. Please use with extreme caution. My son never sucked his thumb or used a binkie. To my daughter on the other hand, the binkie is her security blanket, in all situations. It was attached to her lip like a growth, a cute one, but a growth. Although it doesn’t feel like it upon withdrawal, I am sure benefits outweigh the risks, increased brain function and reduced risk of SIDS seem like a far cry when your child wants the binkie, you can’t find one in your purse and find yourself sweating as you dart to the nearest baby aisle to calm the latest public display of “binkie attachment”. Not only should the binkie come with a warning label, it should come with a withdrawal manual: Tips to successfully “detatch” the binkie from you toddler, physically and mentally. I’ve heard tips that range from going “cold turkey” , burning the tips off, to dipping the tips in coffee (which seems like a disaster waiting to happen). I tried the cold turkey trick and only lasted about 5 hours because the entire 5 hours, my daughter cried for her binkie. So I went for a slightly more gradual approach, after all, my daughter is persistent, demanding and not one to fall to any old cheap trick. I cut off the tips to the binkies and laid them on the floor in her “usual” spots. As she spotted the binkie, she excitedly made her way to the binkie and as fast as she put it in her mouth, she took it out in disgust. “Broken” she proclaimed, and dropped it on the floor. A bit confused she looked at it for a while and walked away. I approached her with the binkie (the broken binkie) and she turned her shoulder to me and walked away. I said, “It’s broken. Should we put it in the trash?” And she nodded her head. As we said bye bye to the binkie. It has only been one day and I do let her keep one in her crib to use in her crib only. I’m all for not using the binkie during the day, but I wasn’t ready to give up a couple sleepless nights. Not quite yet. Like I said a couple days ago, we are trying for a third and I wonder if I will find myself at wits about whether or not to give my newborn the binkie. Afterall, binkies now come personalized, in fashionable colors and blinged out. Some subjects are probably better left untouched, especially when your dealing with a 3 year old, but of course ,a venture into the unknown is always the thing we mothers strive for, right? Maybe not. But I say I won’t go there and then for some reason I find myself deep in the trenches, unable to get myself out. Here is one of the those examples. So, I took a deep breathe and a big step and replied, “Adam’s daddy is sick.” I thought he would leave it alone. “So , can we go visit him in the hospital?” George questioned. A sign of relief, or so I thought as I wiped the sweat of my brow and went to turn on the DVD. Good, I thought, he is onto the next subject. Why I thought it would be so easy I have no idea. After nap time, my son awoke on a mission. The first words upon waking up, were a venture further into the subject then I ever imagined he would go. “Mom, we need to get the bus schedule”, George demanded. “Who is taking the bus?” I asked. I don’t know the best way to handle the venture into heaven with my 3 year old. I don’t think I should explain to him death. He never knew Adam’s dad. He thinks heaven is a destination, I think he understands it is unreturnalbe, but he thinks it is a destination. I know now, never to under estimate the mind power of a 3 year old. He was gentle in his questioing and thoughtful in his answers and for all we know, maybe he found the answers. The ones we never look for. My 18 month old knows no boundaries. Today, my son was playing with one of his trains. Sophia walked up to him, grabbed the train and ran. As George walked away with his train, Sophia went and grabbed his shirt from behind and tackled him to the ground. Sophia is half the size of George. I really have to get her to understand their are consquences for her actions and she can not have the run of the house, because right now, she has the complete run of the house. She is in and out of the fridge at least 2 dozen times a day, just opening it and taking stuff out like a toy, she climbs on tables, rips books, throws toys,plays in the toilet and many, many other things, I don’t want to mention, on hesitation that you may think I have absolutely no control over my children (with Sophia, I may have no control). My friend was watching an episode of Supernanny a couple years ago and saw an episode about giving kids Sophia’s age a time-out. The technique was to take the child and sit the child in your lap, restraining them so you can’t move, facing the corner. You keep the child in there for 1-2 mintues and but don’t give them eye contact or talk to them. My friend did this with her daughter and it worked out well. I’m going to start this tomorrow, I’m desperate. Saying no to my daughter only fuels her fire and it’s getting out of control. I really need to control this situation before she is 3 and gets even worse. My dad thinks that on the first day, I’ll be in the corner with Sophia an easy 30 times. In the meantime, have any adivce, don’t hestitate to let me know. This morning, while my kids where watching their usual PBS shows, I announced that I needed to take a shower. My son startled me at what he said next. My son looked at me and explained, “You do need to take a shower. I like my color, not yours,” as he pointed to his cheek. I hesitated, not knowing what to say next. “I like Sophia’s white shirt.” He explained. That should have been key enough that he didn’t mean what he said, or what I thought he meant. Probing. “You don’t like me skin color?” I asked again, trying to get into the head of my 3 1/2 year old son, an impossible task itself. “No, I like your skin color.” he said. I don’t know why, but I was close to tears. I know this is probably true. I don’t know if I am ready to talk about race stuff or if I am ready to handle it. I know it’s not now, but it will be some day. What if your child, who now looks at you with such unconditional love, all of a sudden has questions to why mommy is “different”? My dad, who is part Caucasian and part African-American, insists that even though your kids probably will ask questions, they will always love you because you are there parents. And I guess that’s true. I remember being called an Oreo Cookie (kids can be mean) at school but it never made me not like my parents for being one race or the other, it made me not like the kids calling me names. So I guess all I can do is tell my kids that there are many different types of people in the world and being one way or another doesn’t make you better, it just makes you different. And differences are what make our world what it is today. People are different sizes, shapes, races, religions, and so much more. Besides without all these different people we wouldn’t have Sesame Street, Spongebob (a sponge) wouldn’t live in the Ocean with a squirrel and a star fish and Bob the Builder wouldn’t be good friends with Scoop, Muck or Dizzy. Now that, my 3 year old should understand. …and my awesome sister-in-law can find it. The Peter Potty Flushable Urinal. Yes Kris, they really do think of everything. And you bet I’m gonna but it! I am crossing my toes as I write you this (would do my fingers, but I have to type, right? anyway….) in order to ward off all bad potty spirits, as I take time to gloat about the success of my son’s potty training attempts. He has stayed dry for 3 days, no accidents. We bought him just your good ‘ol plain potty and it worked. Number 2 is another story but he has stayed dry, peeing on the potty all the time. He wakes up dry from naps, bedtime and stays dry while he was at camp (though I put him in a pull up). 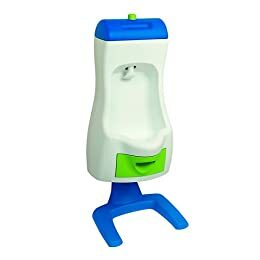 So, he was using the big potty and but we decided we needed to buy him a potty his own size, just in case he decides to try number 2, so that he has his feet planted firmly on the ground. (we bought him one last winter but it had too many bells and whistles and all he wanted to do was play in it and take it apart). Anyway, he still refuses to sit on the potty, he will only stand, so you can only imagine, having to aim at such a low target, has left much room for, shall we say creativity. He now plays “fire hose” if you get my drift and if he can’t hit the potty, he hits any target in his way, the wall and his sister, yes, he peed on his sister. I think the whole watching her brother pee on the potty has left some room for confusion on her part. We bought her a little Baby Bjorn potty (so she wouldn’t mess with George’s) and she wanted to sit on it at first. Now she stands in front of it, lifts her shirt and pull her pants down. OY!! !